A 3:38 video clip made for the BrickFest 2003 animation comp. The music in this film is NOT my own, this video has been produced for non-profit reasons for a non-profit brick animation competition. The artists (The Cure) and their publishers own the rights to this music. I made this animation in good faith, out of my appreciation for 'The Cure', and not for any personal profit. I hope you enjoy watching it as much as I did making it! 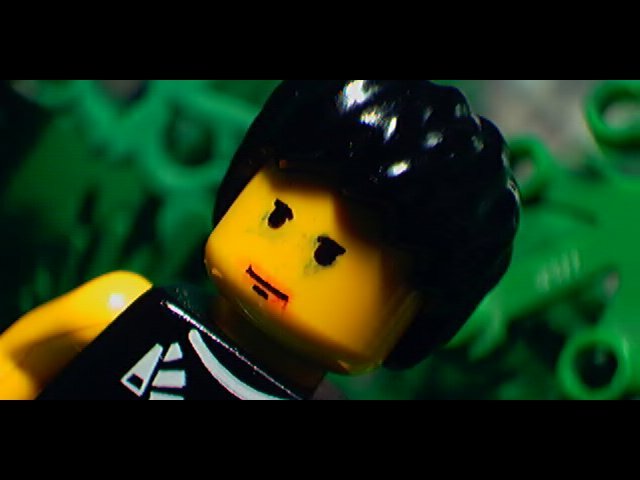 When the BrickFest 2003 animation comp theme was announced (a music video) I was not terribly inspired to film an entry. I thought I was not 'into' music videos... how wrong I was! So with the lyrics in front of me, some ideas sketched out, I checked song length, as the limit was four minutes. There is not one official version of 'A Forest' that runs under 4 minutes, (at concerts the song often extends to 10 minutes or more in length!) so I had a problem. I didn't just want to pick the shortest version I could find ( a remix or edit for a single) because I love the intro and outro on the album version (that runs at 5:54), so I deciced to meticulously 'butcher' one of my fave Cure songs. I was seriously picturing Robert Smith's face whilst doing this... and will add here "I'm sorry Robert if I've trashed the song". Anyway, I wanted it to sound like a full song, and to include all the verse/chorus bits plus the intro and outro. So I spent a day playing in cool edit, carefully tapping my foot and timing, removing enough to balance each verse, the chorus, the guitar solo and trying not to destroy the intro and outro. It was almost a different song, and doesn't sound too bad (though I do not prefer my 'edit' to any of the official variations). The end result: 3 minutes 38 seconds. It would fit the 4 minute time limit. Next was to decide upon the actual content. I knew I wanted a little Robert Smith minifig in there, I had to include Ned Kelly (he's in all of my films), and I wanted to tie the video to both the lyrics and the audio as much as possible. I also wanted it to look like an 80s clip, which I felt required careful use of repeated footage (watch carefully, there is heaps, but it is re-framed, lighted differently, cropped, moved etc), and some sort of 'multiple faces on the screen all at the same time effect'. I also really wanted to revisit the 'Doorway world' of my earlier film, the lines: "I'm running towards nothing/Again and again and again and again " seemed to fit perfectly for this. I also made the decision that the girl would not be real, and would 'live' in a realm unattainable to the other minifig, I used black and white to highlight this, but still allowed 'Robert' to hear or feel the presence of the girl. I made a rather small set using every piece of lego greenery I had (sorry no production shots... I seriously filmed almost non-stop for a weekend... when inspiration hits I just go for it) and proceeded to capture all of the establishing stills for the opening sequence. I then filmed a number of stop motion camera movements at the best quality I could, each of the same length (the length of a discreet musical phrase in the song), so that I could re-arrange them, zoom in on them, pan across them, and change the lighting to make the repeated segments look different. I also wanted him to pass through an old doorway to reach the 'nothing' so I decided to make it look like ruins (or something). Throughout this I constantly re-arranged my little forest set, moving the trees, shrubs, green bricks, spider webs, vines etc etc to try to create the impression of an immense and endless forest. It was then time to film the nothing scenes. Filmed quite simply with good lighting against a white cardboard backdrop. It was important to me that he change direction, so instead of running from left to right or top to bottom 'Robert' runs out in the same direction then turns so as to be moving from right to left. He then becomes 'confused' and we see him literally running in a cirle (the minifig was standing on top of a rotating brick piece and I only filmed one rotation, being careful to match the start and end frames so I could run it on an endless loop). This is when the 'multi-head' effect hits, showing him simultaneously running in different directions (cancelling all movement out) and then adding the rotation as well. As for what exactly is happening here and where it is, I have no idea. I like filming with a concept in mind and leaving the job of interpretation. The post credits bit is one of my fave's. We see 4 different shots of the mini-fig before he is 'whisped' away into nothing, if anything it helps to re-inforce the dreamlike quality of the film. Post Production: There where two main things to contend with here, and in total the editing after the film took about two months of on again off again work. 1. Musical Timing: I had to get this nailed down well, and this took me ages. I really wanted it to be an almost visual overload of cuts, to confuse the viewer as much as the minifig was confused, to change light levels and points of view. It really did take hours and hours (and hours!) to match the cuts and scene changes to the correct beat. 2. Lighting: All of the forest sequence was shot in the same light. If you look at the opening stills, that is the light level of all shots. What I wanted intended was to send the minifig (and the viewer) deeper into the darkness of the forest so that the contrast with the 'nothingness' at the end was immense. This was very time consuming because I wanted to re-inforce the green whilst giving an impression of darkness, and probably took the longest amount of time in the whole project. Update: I didn't win any of the awards for the comp, but without the comp to drive me I would never have completed this film. At heart, I am probably more happy with this animation than any of my others.